Artist’s impression of two tower blocks to be developed by the Corinthia at the tip of the peninsula at St George’s Bay, where unlimited land may be reclaimed under a draft deed, subject to planning permission. The government has granted unlimited rights to the Corinthia Group to reclaim the seabed around the peninsula it occupies at St George’s Bay and build on it. 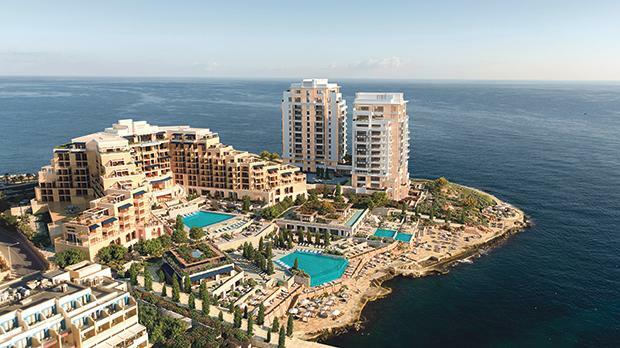 According to a still unpublished draft deed, negotiated by Tourism Minister Konrad Mizzi, the Corinthia Group has been awarded the whole of the St George’s Bay peninsula for at least 99 years at a fraction of current market prices, to use not just for hotels but also for speculation. Now, The Sunday Times of Malta can also reveal that the government has conceded to let the group reclaim the seabed surrounding the whole peninsula. According to the draft deed, which has still to be approved by Parliament and signed, the Corinthia Group can then use the newly claimed land to build apartments, offices and retail space for purely commercial purposes. The draft contract does not impose any sort of limitation to how much of the seabed the hotel group will be allowed to reclaim. This is solely up to the Corinthia, subject to planning permits and relevant laws. The government is obliged by law to seek Parliament’s approval for every transfer of public land to third parties. In the case of the St George’s Bay seabed, however, it is renouncing to this obligation – the deed specifies that Corinthia “shall require no further consent from the government as the direct owner” of the seabed. The only condition imposed by the government is a clause normal to every land transfer contract: that nothing can be done without a permit issued by the Planning Authority. The Corinthia has so far not indicated publicly that it plans to reclaim the seabed surrounding ‘its’ peninsula. It has only said it plans to develop the area in phases. The first phase will take more than five years, including the redevelopment of the Corinthia St George’s Bay hotel and the building of 18,000 square metres of sea-view apartments for sale. Environmental studies would have to be conducted before any land is reclaimed. A technical expert familiar with such negotiations, who spoke on condition of anonymity, questioned the open-ended concession granted, with such few limits being imposed and the right to further consent being waived by the government. The agreement had been proposed for Parliament’s approval just a day before the Christmas recess but the government was forced by the Opposition to delay the discussion. The terms granted to the Corinthia Group have prompted harsh criticism from developers and real estate agents, who view them as too advantageous. 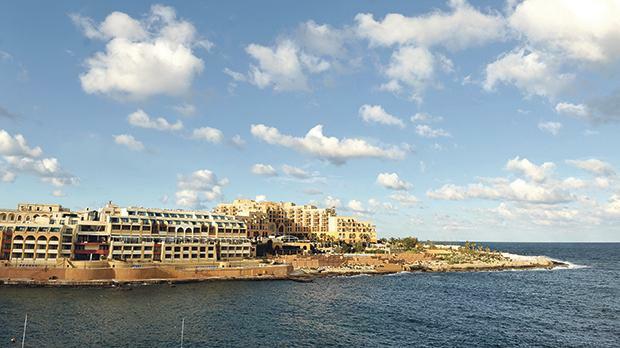 The Corinthia Group had acquired the 70,000 square metres of Malta’s golden mile back in the 1990s, paying low ground rent on condition that the area is used exclusively for tourism purposes. The new deal means it has convinced the government to let it build a total of 100,000 square metres of residential apartments and offices for sale. It will also be refurbishing the Corinthia St George’s Bay into a ‘luxury’ hotel and turning the Marina Hotel into a five-star property. However, in what has been described by real estate agents as “ridiculous terms and conditions”, the government agreed that the group pay a premium of only €17 million for the new rights it is acquiring. Furthermore, this amount will be paid over many years, possibly decades. According to real estate agents, the concession would currently fetch a market price of at least €700 million without any land reclamation rights. Other organisations representing the business community, such the Chamber of Commerce, Malta Hotels and Restaurants Associations and the GRTU, have not publicly made their position clear although The Sunday Times of Malta is informed that some members have expressed their concerns internally. Dr Mizzi told Parliament that the government had conducted negotiations with the Corinthia along the same parameters that applied to another controversial deal, that with the Seabank db Group for what is known as the ITS site, situated adjacent to the Corinthia’s properties. The ITS deal is now under the scrutiny of the National Audit Office. The Opposition parties in Parliament, the PN and the PD, have declared their opposition to the Corinthia agreement. It is not yet known when the government intends to seek Parliament’s approval as no date has been set by the Leader of the House, Deputy Prime Minister Chris Fearne. More than a thousand residents from Xgħajra and nearby towns and villages in the south have signed an online petition against any plans to declare the area suitable for land reclamation. A spokesman for a new pressure group called ‘Xghajra Sea Front Interest Group’ told this newspaper that since the start of the online petition, many people had started taking an interest in the issue. They were asking questions about the government’s plans suggesting that the Xgħajra coast could be the only area in the Malta where large scale reclamation projects can take place. Last month, this newspaper quoted sources at the Environment and Resources Authority (ERA) stating that it had singled out the coast of Xgħajra as the only viable location for a ‘major’ land reclamation project. The petition calls on the authorities to leave the area alone as residents don’t want the destruction of the pristine coast which beautifies the area.